And the research matters even more to Florida because state law requires that schools spend half of their instructional budget on digital lessons. School districts have spent the past few years adding Internet bandwidth, improving networks and adding high-tech teaching tools. The more technology, the worse the performance on tests -- This was the big conclusion. The students who spent the most time using computers or on the Internet in school did worse than expected on international tests. The students who ranked in the middle for technology use -- what the OECD called moderate use -- did the best on international tests. 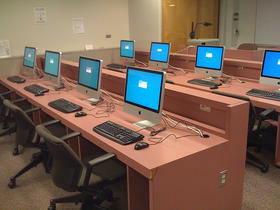 The OECD noted that East Asian nations, such as China and Singapore, intentionally limited students use of technology. They also used more traditional techniques teaching math -- and have the best-performing students on math exams. The OECD couldn't pinpoint why students who use technology more didn't do as well on tests, but suggested a number of explanations: Reading online is a different skill than reading on paper, technology can be a distraction and schools aren't making the best use of technology. Teachers who use technology get better results -- The OECD found that nations that emphasized training teachers to use technology performed better on tests. That meant allowing teachers to connect by video conferencing, observing other teachers, sharing lessons and ideas and just chatting with other teachers. Again, it was East Asian nations that encouraged teachers to connect via technology that also had the best-performing students on exams. For the most part, Florida policy has focused on connecting students to technology. Plenty of teachers are advocates of high-tech lessons, but the OECD study suggests the state and districts might want to consider emphasizing training for teachers to get the most out of all the new gadgets in classrooms. Slow down and get it right -- Right now, the way schools are using technology isn't working for students. Schleicher said schools might want to take a step back, look at what's working and focus on those areas. In Florida, schools are moving ahead with the state's digital instruction mandate and lawmakers are considering setting aside money in the state budget each year for new technology. "It seems technology is important in the lives of students," Schleicher said, "we just don't seem to get it right, yet." U.S. is among the most-connected, digitally literate nations -- The good news in the study was that U.S. schools have among the best student-to-computer ratios in the world at about 2-to-1. And the OECD found that while low-income children were less likely to have access to the Internet than wealthier children, about 80 percent of low-income children had access to the Internet. The OECD also said that U.S. students are among the most digitally literate in the world. The group asked students to use computers and the Internet to perform a series of tasks. U.S. students had some of the top scores in the world. Digital skills are important -- Right now, students aren't getting good results from technology in schools. But Schleicher said computer and Internet skills are important job skills. And other research shows that most workers never use Algebra 2, Caluculus or other high-level math courses in their work -- but most jobs require some digital skills. Teaching students how to use computers and the Internet is still time well-spent.